Light comes in, goes through pupil, and hits rod. Normally rod is turned on, but when light hits turns off. When rod is off, it turns on a bipolar cell, which turns on a retinal ganglion cell, which goes into the optic nerve and enters the brain. Retina is made off a bunch of dif cells – rods and cones. As soon as light is presented to him, he takes light and converts it to neural impulse. Normally turned on, but when light hits it’s turned off. Inside rod are a lot of disks stacked on top of one another. A lot of proteins in the disks. One is rhodopsin, a multimeric protein with 7 discs, which contains a small molecule called retinal (11-cis retinal). When light hits, it can hit the retinal, and causes it to change conformation from bent to straight. When retinal changes shape, rhodopsin changes shape. Transducin breaks from rhodopsin, and alpha part comes to disk and binds to phosphodiesterase (PDE). PDE takes cGMP and converts it to regular GMP. Na+ channels allow Na+ ions to come in, but for this channel to open, need cGMP bound. As cGMP decreases, Na channels closes. As less Na+ enters the cell, rods hyperpolarize and turn off. Glutamate is no longer released, and no longer inhibits ON bipolar cells (it’s excitatory to OFF bipolar cells). So bipolar cells turn on. This activates retinal ganglion cell which sends signal to optic nerve to brain. A photoreceptor is a specialized nerve that can take light and convert to neural impulse. Inside rod are optic discs, which are large membrane bound structures – thousands of them. In membrane of each optic disc are proteins that fire APs to the brain. Cones are also specialized nerves with same internal structure as rod. Rods contain rhodopsin, cones have similar protein photopsin. If light hits a rhodopsin, will trigger the phototransduction cascade. Same process happens in a cone. 120 M rods vs. 6 million cones. Cones are concentrated in the fovea. Rods have slow recovery time, cones have fast recovery time. Takes a while to adjust to dark – rods need to be reactivated. 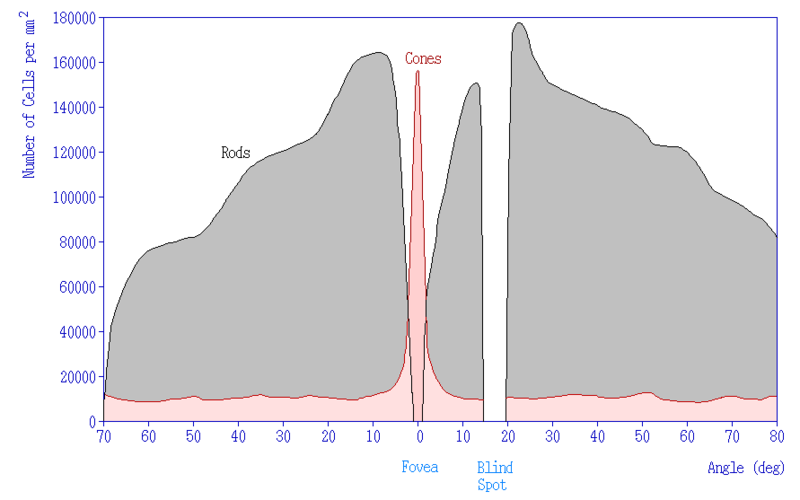 Where optic nerve connects to retina, blind spot – no cones or rods. Cones are found throughout the fovea, and few in rest of eye. If we zoom in on fovea – no axons in way of light, so get higher resolution. If light hits periphery, light has to go through bundle of axons and some energy lost. So at fovea light hits cones directly. How our brain makes sense of what we’re looking at. Right side of body controlled by left side, vice versa. How does it work in vision? All right visual field goes to left side of brain, all left visual field goes to right side of brain.